Made this tonight, I know it’s an old recipe, with brown rice and it was amazing. I substituted a jalapeño for the green pepper and added half of a limes juice. This turned out amazing. I followed everything else in your recipe exactly and it’s the first time I e made rice and beans that aren’t too salty! You need to add slightly more water for brown rice. I’ve been a forever follower and somehow missed this.. you have no idea how long I’ve been looking for a good “Morros y Cristianos” recipe and I think this is it! Thanks Gina! What can I use if I don't have that pot? can you make it with raw beans instead of can beans?? Made this last night. I'm sure it's delicious on it's own but i wanted to make it a one pot meal so I added some ham and a small can of tomato sauce. I doubled the beans. I did not double the rice but I did use brown rice. Since I added the tomato sauce I only used 1 C. of water. It was AMAZING. My son could not stop eating this. Next time I will follow the recipe as directed and try it with the Pernil. I can't wait to try more of your recipes…especially the Latin food. I am an Irish white girl but I LOVE Latin food. Thank you for this website. It will help my husband and I stay on track. I have used a rice cooker but one made out of clay and has settings for white and brown rice and stew. Has anyone tried this by using their rice cooker? I saw a few comments asking if they can use a rice cooker I was just wondering if anyone had thoughts about that. I plan on making this tonight and I am excited! I'm so glad I found your website and I can't wait to try other fun recipes! Waiting for rice to cook,,, I simmered it for 40 minutes, then sampled, and rice was not done yet. Am I doing something wrong? I just made this for dinner. 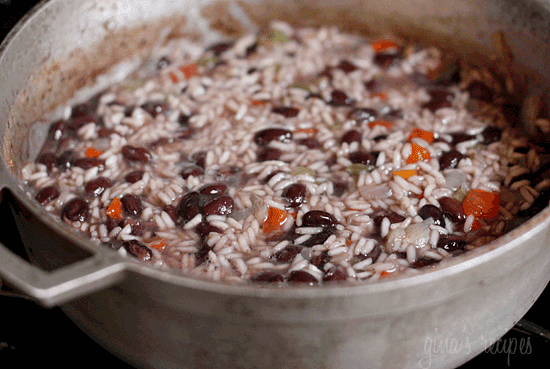 I was craving for Cuban rice and beans, and this recipe satisfied my palate. Instead of water, I used low sodium chicken broth. I also added 1 tbs of cider vinegar. I garnished with chopped cilantro and sprinkled a little bit of lime. My kids and my husband loved! 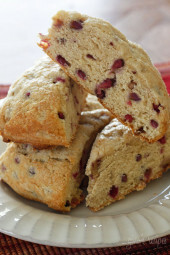 Thanks for sharing this yummy recipe!!! Hello all! I would like to make this using brown rice but I am not sure how to adjust the recipe since brown rice does take longer to cook. Any suggestions? I just made this for my family and I used brown rice. Instead of 1 cup I used 2 cups brown rice with 8 cups water. It worked for us and came out great! Loved it! I just made this for the family. My toddler came at me with his dish after scraping it clean and said, "More! More!" I was literally beaming with pride. I made it with brown rice and it took a while to cook, but boy was it good. Best of all–simple, healthy, ingredients. Another AWESOME recipe from Gina. I'm never let down. I just made this and it really turned out so great. I didn't have black beans so I added kidney beans. Didn't green bell pepper but had red and yellow. Seriously, what a great dish. We like rice with everything so we are going to serve it with some steak. What a great site! I'm looking forward to trying more of your recipes. I am a very inexperienced cook and was wondering if you could give me an estimate of how much salt to use in this recipe (I am kind of a disaster at estimating!). Thanks! Enjoyed this one. With the leftovers, I added chunky salsa, chopped spinach and then melted a little cheddar on top with a dab of sour cream. Yum! ARROZ CONGRI is not rice and BLACK beans, but rice and RED orKIDNEY beans. ARROZ MORO or MOROS or MOROS Y CRISTIANOS is rice and BLACK BEANS. I liked this, but it could have used more flavor. I am not a vegetarian, so I might substitute chicken broth next time. loved it.it like i have had before. This came out well. I found that the recommended 20 min cooking time was perfect. Next time I will be more aggressive with the seasoning and probably try vegetable stock instead of water. As Cuban ,I have to correct .."Congri"is red beans mix with white rice..Black beans mix rice is MOROS.. Some parts in cuba make it with red beans, but MORO Y CHRISTIANOS (moores and Christians) is white rice and blacked beans cooked SEPARATELY, but served together side by side. you are right. this is not congri. its moros y cristianos "moros". Totally awesome!!!! I made with Cajun shrimp and tilapia and loved it. Hi there! I love your recipes so far, and love that you made a skinny version of a family favorite! My question is, can I make this in a rice cooker, versus a dutch oven? Thanks! Am I correct in assuming I shouldn't use instant rice? Made this tonight and it was delicious! I love black beans, and rice is a very common side dish in our house so this was just perfect! I've tried making this before (different recipe) and it was a disaster. Made yours and oh my – I'm sharing it with the world! It was so yummy and it will be come a staple in my household. We ended up eating this tonight for dinner as a side with grilled steak and grilled corn on the cob. it was delicious just like i posted earlier! my daughter loved it! i made this today ahead of time as a side dish for workweek meals as i have been grilling a lot lately. i snuck a taste and let me tell you it was delicious. the best beans and rice i have ever had!!! this will be on my meal rotation on a regular basis along with my other favorites from this site(spinach lasagna rolls, chicken parm). I made this tonight, thinking it would be just for my family… Then the in-laws showed up. I worried this wouldn't be enough, as I didn't double the recipe, but there was plenty, and everyone helped themselves. Paired with a steak salad and garlic-toasted rolls, this was fabulous, AND they think I can cook! Thanks! I made this to go with our dinner this evening and really loved it! It's an easy and simple dish but ended up being tastier than I expected! This is a definite "make it again" dish! Just ate this and it's delicious! I just think 20 min was a bit much, the rice was overcooked. Will try for 12 to 15 min next time! Do you think this can be successfully made in a rice cooker? My thoughts exactly. I tried doing it on the stove top and failed miserably…as I always tend to do when I try cooking rice that way. The rice cooker is my only hope! I'm going to try it. I'll let you know how it turns out! I tasted the dish before the water boiled and I found it bit bland as well. I searched online and found authentic recipes which require more seasoning. Try these additions to make the dish more flavorful. I added more garlic, 1 1/2 tsp of salt, 2 tsp of cumin, 1/2 tsp chili powder and 1/2 tsp of oregeno. I will be eating this for lunch accompanied with a nice side of vegetables. I just got done eating this for dinner. It was yummy but I did a few things different. First I don't think I added enough salt while it cooked; so we had to add some to the rice on our plates. I found this was missing a pop of flavor so I added some lime juice and then for a kick of spice I drizzled some sriracha sauce! It was very tasty by the end. I served some caribbean jerk seasoned chicken thighs on the side. We really liked this receipe. We paired with Pernil al Horno (tyler florence). YUUUUmo- Hubby likes things a bit spicer though? Any suggestions? We did go light on the salt. I LOOOOOOOOOOOOVE this recipe! I made it tonight for the first time and paired it with the pollo sabroso… OMG. I made the roasted potatoes with chicken sausage (I used lean sweet italian turkey sausage) a couple of days ago and it was awesome as well. My kids even liked it. Girl, you are a HIT! I love this website. So easy, and fantastic. I added 1 cup of shredded chicken, topped it with crumbled light feta and served it with Tostidos Baked Scoops for a meal. Delish! I just love your website and have a binder full of your recipes. I finally got around to making this one with brown rice. It just had to be cooked a little longer because of the brown rice but definitely a keeper. Thank you Gina! I bet it was great with brown rice, I'll have to try that next time! I made this recipe yesterday. My family loved it! I used brown rice, so the cooking time was about 40 min. It was excellent! And it is a great way to use up any peppers from the garden. I love this site! Everything I have made is always good! And the pictures are beautiful! Thanks!! I have made several of your recipes and all have been a hit at my house. I followed this one exactly but for some reason my rice was more of a greyish color rather than brown like yours. My boyfriend took one look and gobbled it all up. Which made me feel great but now that I am looking at your post for the second time, my rice looks a little different in color. Could you tell me why this happened? Can't wait to make this again tonight!!! YUM. Serving it with the Zuchinni Enchiladas…. (I cut them in half so half a serving of both meals)….yum…. Tried this recipe last night and it was DELISH!!! Highly recommend not draining the black beans as the color and flavor the juice added was awesome. Thanks Gina!! 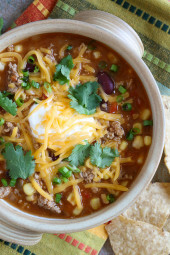 Gina: I really want to make this but I hate the taste of undrained/unrinsed black beans. If I rinse and drain them and add a little chicken broth and salt to the pot, do you think that would be a reasonable solution? Made this tonight and paired it with the peruvian chicken (I shredded mine and tossed on top) and aji verde sauce. SOOOO GOOD!!!! My boyfriend announced that – hands down – this is the best meal I've ever made. I think I agree with him. THANK YOU! This was good! So many different uses! 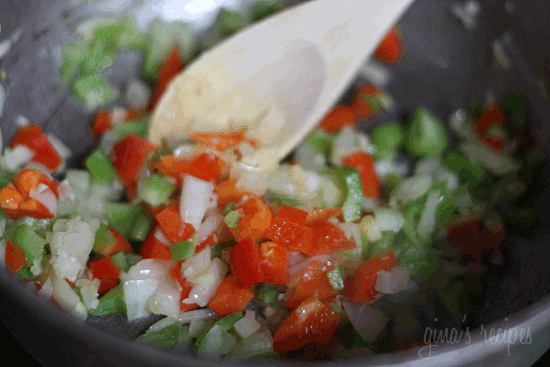 Can be mixed with chicken, in a burrito or taco salad…. 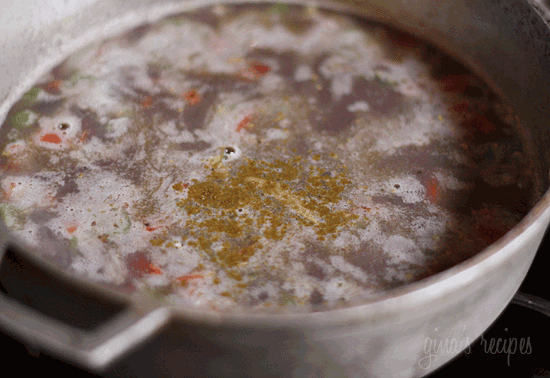 Leftovers can be tossed in soup. Yum! Once again, I have this on the stove. I try to throw in a vegetarian night once or twice a week, and this is such an easy, delicious one pot meal. Thanks Gina! I've never frozen rice so I am not sure. I would imagine it would be ok. It sounds like you didn't add enough salt which would make the rice taste bland. I made this tonight for dinner. It was a big hit with my Mexican husband! I loved all of the peppers in it, too! Made this for dinner and it was a hit! It would also be great as a burrito filling with some shredded chicken in a whole wheat tortilla. Thanks for another great recipe! Rosanne, I love Cuban food! Glad you tried something out of the norm for you. Gina, I really love your site. Your recipes are delish! I've never made this before and it turned out perfectly. I also love the tortellini soup. I make it every Sunday and have it for lunch all week. Mmmm, addicting! Made this tonight….omg so good. Never have eaten Cuban food I decided to give it a try. Trying to eat more beans thanks to high cholesterol. Wow this was amazing. Already have the left overs packed for lunch. And so easy too and quick. Def something that will be made weekly. You are amazing Gina. I thank you so much. Kelly, You're right, I just rechecked. Thanks for noticing, I'll update it now. This was deeeeeeeeelicious! I served it with your Cuban Pork and turnip greens. OMG…filling and so, so, so good. One thing, though…when I ran the NI through the tracker doohickey, it came out to 6 points, P+, not 5. You had make me soooooo happy with this recipe!!! I love "arroz congri"!!! We eat this dish in PR with "carne guisada" usually, at least in my home. one of my favorite and it's gluten free!!!!!! Janeen, it's imported from Colombia, made of clay from local artisans. I'm not sure where you can find them here. Isn't it beautiful! Gina I love your site and recipes. Have tried several and never disappointed. Will try this one very soon. I love the pot you used. Where could I get one? My husband loved this dish. We paired it with the Broiled or Grilled Pollo Sabroso. He loved both! Thanks so much for a new dinner. I am making this for dinner tomorrow can't wait to try this one. Love your website. I love beans and rice! This looks so flavorful! Thanks Amy! I love the sound of your story, I pictured myself there in the lush rain forest. By the way, I love a sunny side egg over rice, it's totally a Latin thing! I would eat this for dinner for a very low cost meal. In Colombia they do something similar with left overs, yum. 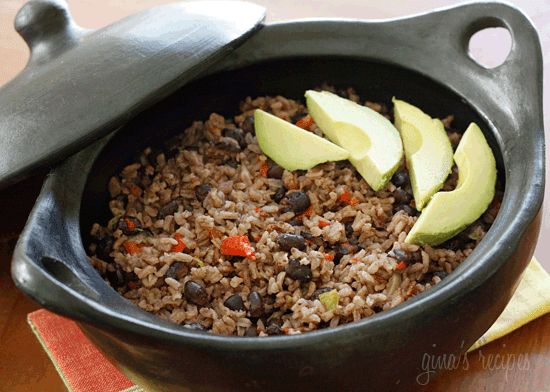 In Central America this dish is called gallo pinto. It it made almost the same way as your recipe for arroz congri with a few variations. 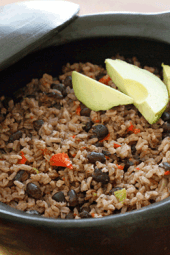 In Costa Rica, for example, the gallo pinto is eaten at breakfast and is made with beans and DAY OLD rice. Normally beans are made by the bucketful on Sunday to last all week and then every morning rice is made for lunches and dinner. So in the morning someone would take the beans from the large pot and yesterdays left over rice and turn it into breakfast. I used to have a GIANT mound of it with a friend egg on top served with bread. O.M.G. You NEED to try it, it's SO good. I don't know if that makes it more unhealthy but it is definitely a way to use up extra arroz congri if you have it! p.s. I'm new to the site but my bf and I are on a major diet right now so finding yummy and health food is a must! Thanks for the great recipes. Thanks for suggesting the fried egg on top! I've never thought about that or even heard of it before–maybe because I'm not latina? I made this arroz congri for supper last night with pernil, but this morning I fried up some eggs and my hubby and I had them on top of some of the leftover rice. It IS delicious! Love this recipe. I love black beans and rice and I have everything I need at home to make this so it will be on my menu this week! Hi Gina, thanks for all of your fabulous recipes! Being cuban, this is my specialty and a must have at every family function. I make it with parboiled rice and I pour in some Goya mojo marinade while the beans are cooking before the rice absorbs the liquid…it won't affect the calories and it's amazing! Keep those great recipes coming Love ya! Mara- white rice gets really fluffy when cooks, it expands, changing the recipe can always result in changes to texture, servings, etc. Personally I've only made this with white. Brown rice is not common in Cuban cuisine. I made this tonight with brown rice and a 19 oz can of black beans. I used chicken broth for 1 c of water, and used a full second cup of water. I let it cook, covered, for 50 minutes and sit for 10 minutes off the heat. It was a touch too soupy – I think next time I'll use only 1.5c liquid when using 19oz of beans. But it was very tasty, and a great side dish with your Peruvian Roast chicken – which was also delicious. Thanks Gina, love your recipes! I made this tonight!! It was delicious!! but, I used brown rice, didn't have any white, had to add some extra water and got only 3.5 cups, increasing the points to 9!! EEK!! Did I do something wrong? Thanks!! Aime, I'm so happy you enjoyed it, this is one of the meals I can make at any time since I usually have all the ingredients on hand. La Reveuse- Salted, not sweet. Thanks Carol! I don't list the amount of salt in my recipes since I do it to taste, so my nutritional values for sodium would not be accurate. Brittany, we were thinking alike. Omg, this is so freaky, I have been searching all over the internet for a recipe for congri that was healthy and here it is. Thank you so much for all of your recipes! Today was my 1st visit to your site. Your recipes and photos look wonderful. I'd like to try them. For health reasons, I am on a sodium restricted diet. Is there any chance you could include sodium content along with the other nutritional values? Too funny and freaky. I just bookmarked your pernil recipe last night to make this next weekend while we're out hiking (we've made a bunch of your recipes), and was thinking that I can't believe you haven't ever posted a congri recipe. I love congri, and order it every time I go out for Cuban food. Thanks! Now our meal for Saturday is complete: pernil, congri and a tropical fruit salad. Some canned black beans are in a salty solution, some are in a sugary one. Which one is this? I was so happy to find this recipe this morning. I opened my refrigerator this morning to find nothing much but a huge red pepper. I had onions in my pantry and black beans in the cabinet. This was delicious and so easy to make. My husband loved it too! As always thanks for sharing. Heather, yes, black beans are perfect for vegetarians because they are higher in protein than other beans. You will all love this, I promise! 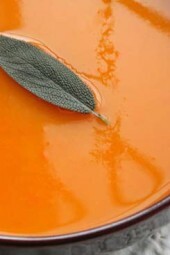 This sounds very close to my dad's recipe, will be using it tomorrow for thanksgiving thanks for sharing. Oh how I love beans and rice. Like you said it is the perfect vegetarian meal! It's amazing that such a simple dish can be so good, I love black beans znd rice but never made them with sofrito, must be even better.